Newcomer Family Obituaries - Pricilla Manning 1935 - 2019 - Newcomer Cremations, Funerals & Receptions. Priscilla Manning 83 died on January 26, 2019 at her home in Denver surrounded by her family. She was born in Del Rose, Co on May 25, 1935 to Fidel and Tomasita Maestas. She was number 5 of 8 children preceded in death by Lallie (Adam) Fidel (Sylvia) and Orlie. Survived by Flora (Max) Carol (Richard) Becky (Toby) and Theresa (Ron). They lived in Segundo and then Sarcillo. 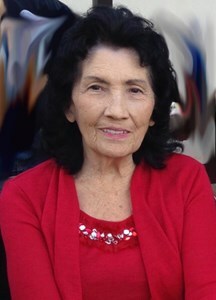 She graduated from Primero High School in 1953 and moved to Denver shortly after, she lived with her sister Flora and Max until her parents and younger sisters followed in about 1957. She had several jobs from waitressing and cooking to silk screening to a candy factory. In 1963 she met a tall handsome man from Tennessee who was renting a room from her mom. His name was Joe Manning and she didn’t see it right away, but he became the love of her life they were married for 55 years. They got married and started their family. They had 4 beautiful daughters (Joanne who was born premature and passed away) Diana, Cindy and Lauralee. She has 4 grandchildren Joey, Derick, Erin and Evan and 2 great grandchildren Gio and Ofelia. After raising her daughters she worked a few more jobs, she eventually settled in at Sloan’s lake bowling alley running the snack bar, her chili was such a hit that after the bowling alley closed, Percy and her little sister Theresa opened their own restaurant and with the help of all the family and all of the regular customers that followed her, it created more great memories. Her cooking brought everyone together for many years after that. From thanksgiving dinners to her delicious spaghetti and especially beans chili and sopapillas, everyone was always so excited to get invited over to eat. She loved shopping, the goodwills, going up the hill and family card games, watching her soaps, reading the paper, listening to Mexican music, Elvis, the Broncos, her roses and wind chimes, sitting right by her heater vent but she especially loved her Colorado Rockies, One of the greatest moments of her life was going to the playoff game and seeing them make the World Series and when she met her favorite player Colorado Rockies player Todd Helton and got to take a picture with him. She was so funny and caring and had very special relationships with everyone who knew her, everyone always claimed they were her favorite and her best friend because that’s how she made you feel. In her later years she became an amazing care giver, she took such good care of her mom for many years and had her so spoiled and then 6 years ago her beloved husband had a stroke and she had to take on the role of care giver again. It was tough on her but she was amazing and with the help of her daughters and grandkids Joe was spoiled too. 2 years ago we seen her strength in a way we hadn’t before when she suffered a stroke as well. Every dr that seen her said that she would never recover and didn’t even give her a chance of survival but she fought and her daughters fought for her. They followed her footsteps and became the care givers they seen in her over the years while taking care of both of their parents. There were so many amazing ups and scary downs but thanks to her family and prayers we had 2 more years with her. Though she did lose her ability to talk she regained a lot of life and in lots of little things we could all see the feisty little Percy we all loved so dearly. On December 22nd 2018, Joe Manning passed away and in just over a month Percy joined him in glory on January 26th 2019. A true love story that left a huge hole in our family and everyone in awe at what hero’s we had among us in the Manning Family. To share a story of Pricilla or leave a message of condolence, please click the "Share Memories" button above. Add your memories to the guest book of Pricilla Manning. As a young boy, I was awestruck with Percy’s beauty that reminded me of country star Loretta Lynn. As a young man, I was humbled by Mrs. Manning’s wisdom that guided a noble path. Today, I’m honored to have been graced by Pricilla in my life and grateful Percy led my beloved daughter as her Grandmother. Percy was my very best friend now and Forever.I cry because she's gone but i smile because she was here.I lOVE you alot and i will miss you . Michael will miss you and everyone in the Aguirre family will miss you. I love my aunt Percy and uncle Joe. It's hard to believe it's true. I have no words that can express my sincere condolences to my dear family. I found this poem and with our family losing so many loved ones over the years i thought it was perfect. Words can’t even express the pain in our hearts over losing my beautiful sister Percy. She was a wonderful sister. I don’t think the world will be the same without her. It was hard enough when we lost Joe. Losing her so soon after is unbearable. I am so sorry girls that you had to lose both of them so soon. She will be missed so much. Her and Joe are together again. She just couldn’t go on without him. Love you Percy. I’ll miss you forever. So sorry Diana Cindy and Lori and family.